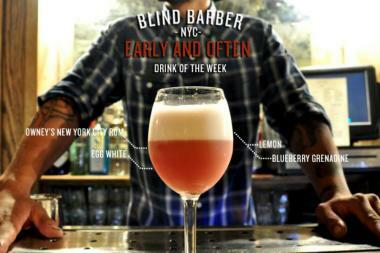 The Blind Barber is among 106 liquor license applicants this month in Williamsburg and Greenpoint. WILLIAMSBURG — Just because North Brooklyn's bar scene has exploded in recent years, doesn't mean the boom is slowing down. A whopping 106 businesses are up for liquor licenses this month within Williamsburg and Greenpoint's Community Board 1, board members said at a recent meeting. Those applications include 37 brand-new licenses, 10 alterations (like when a bar adds liquor to a beer and wine menu) and dozens of renewals (since bars have to renew their licenses every few years). Among the applicants for new licenses is the chain Urban Outfitters, which is seeking to sell booze in its clothing store opening on North Sixth Street and postponed its application from May. Meanwhile, the barber shop-bar hybrid the Blind Barber is back for a second license attempt, after residents' complaints prompted the board to shut it down this spring. Owners of the Blind Barber declined comment on their decision to seek a second chance at their license. Other new license applicants include Our Wicked Lady (to be opened by former Brooklyn Bowl managers), the bakery Charlotte Patisserie (looking to add beer and wine to their pastry and sandwich menu), a new Korean eatery called Dotory, and a new bar opened by the owners of North Williamsburg's 4th Down Sports Bar. News of the massive applicant pool drew murmurs at Monday's community board meeting, but residents did not say they were shocked at the area's further nightlife boom. Local kombucha brewer Brett Casper said the "insane" number of applicants fit right with the neighborhood's business trends. "I'm not surprised...In Williamsburg it seems like every other day a new bar or restaurant is opening," said Casper, who's lived in the area since the 1990s. "I feel like all that's going into the neighborhood are bars and restaurants."